Taoiseach Leo Varadkar at Government Buildings earlier this month. TAOISEACH LEO VARADKAR is attempting to rouse his parliamentary party ahead of a busy period that he says will include “one of the busiest days in Irish politics in living memory”. Varadkar says the government will hold a number of referendums on the same day as the local and European elections on 24 May. The Taoiseach made the comments in a speech to his parliamentary colleagues in a Dublin hotel ahead of the return of the Dáil tomorrow. In is address, Varadkar says that his party would be proposing the votes and “looking to win them”. “Chairman, Friday 24 May – just over four months away – will be one of the busiest days in Irish politics in living memory. The people will be asked to go to the polls to vote to elect their local authority members, to elect MEPs, and to vote in referenda,” Varadkar stated. In Cork City, Limerick and Waterford the people will also vote on whether they want a directly elected mayor to lead and represent those city regions and to work with central government to deliver on the ambition of Project Ireland 2040. Fine Gael will be proposing each of these referendums and plebiscites and looking to win them. A number of different referendums have been promised by the government but dates have not been set, among them a votes on the length of time before a couple can secure a divorce and one on the Constitutional reference to a woman’s place in the home. 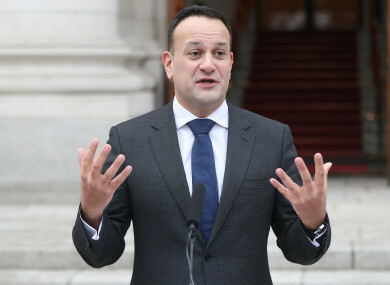 Speaking about the prospect of a general election , Varadkar said there will be one “at some point in the next eighteen months” following the agreement reached between his party and Fianna Fáil. “However as a minority government we must remember the words of Shakespeare and for all things be ready. We must be prepared for anything,” he added. Varadkar also said that Brexit will be “the dominant theme of politics in the months ahead” and that the government will continue to “manage our way” through it. The Taoiseach said that Brexit is among five separate issues that he said the government will “focus intensively on”. The others he named were “safeguarding the economy, jobs, the public finances”, “proving the availability and affordability of housing”, “making it easier to access healthcare” and “ensuring that all parts of our country and all our citizens can share in our national prosperity”. Varadkar also spoke extensively about climate change and described it as “a clear and present danger” that “is not acceptable”. As part of Ireland’s efforts to fight this, Varadkar said that the government will introduce a carbon charge that will gradually increase between now and 2030. “Sometimes when we mention a carbon tax, or a carbon charge, it is not clear to many people what we are talking about. It means a tax on coal, home heating oil, diesel, petrol and gas,” Varadkar said. Email “Varadkar says bumper day of elections and referendums will be among 'busiest days in Irish politics'”. Feedback on “Varadkar says bumper day of elections and referendums will be among 'busiest days in Irish politics'”.